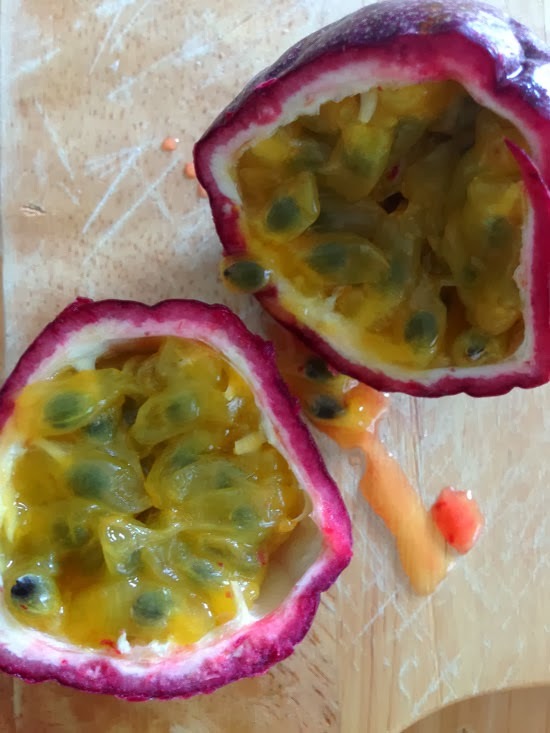 If you’re lucky enough to score a passion fruit at a specialty grocery store or on a trip to South Florida, rejoice. Do a little happy dance when no one is looking, buy the leathery and wrinkled egg-shaped fruit at whatever exorbitant price it commands and try to drive home safely despite your giddy excitement, resisting the urge to text your friends about your fabulous foodie find until you’ve arrived at your home in one piece. I'll show you how to grow the seeds in a bit, but you'll really want to enjoy the fruit first. Make sure that nobody is watching you during this most personal and sensual of moments, unless you’re into that sort of thing, (weirdo) because things are about to get intense. When the fruit is wrinkled and smells so good that you just want to hold it up to your nose for hours, then it’s ready to eat. Find a knife and carefully cut the hard fruit in half. Set aside the second half for later and scoop some of the delectably sweet and tangy pulp into your mouth with a spoon, seeds and all. If you don’t have a spoon, don’t worry. You’ll figure it out. Close your eyes, savor the monumental flavor explosion, and repeat until the last of the juice is dribbling down your chin. Now start on the second half, but take it slow this time; spitting out each seed onto a paper towel when you’re done. After you’ve made a mess of yourself trying to save the seeds, separate them from the membranous sacs (that’s a mouthful) with your thumb and forefinger. Set them aside and take a breather for now. So… what was that amazing fruit and how can you get more? 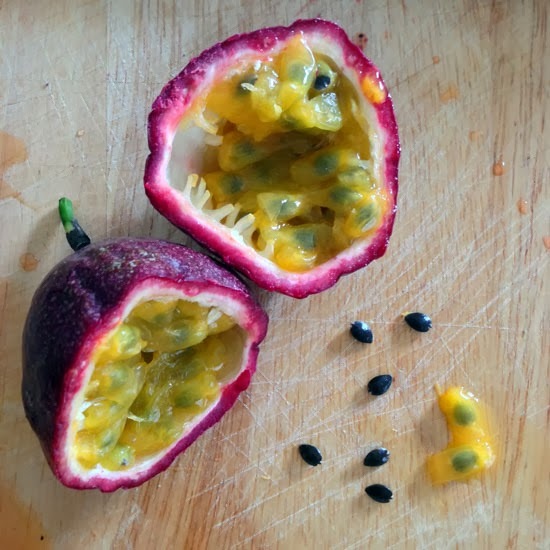 Passiflora edulis is the type of passion fruit that you’re likely to see at Whole Foods or other specialty grocers, and it’s also the one that finds its way into fruit juice, sorbets and candy around the world. Passionfruit has even made its way into my favorite brand of Greek yogurt, seeds and all! To plant your own passion fruit though, you’ll need to plant those seeds that you gingerly collected at the beginning of the article. A passion fruit seedling I planted in my mother's garden. You can plant the seeds in containers, seed-starting trays or (if you live in zones 9b-11) directly in the ground; but two things are of the utmost importance. If you want the passion fruit seeds to sprout, they have to be fresh and the soil has to be warm... otherwise they might turn out to be duds or rot before they even had a chance. If you got impatient and planted them too soon, then you’ll just have to buy another fruit and start again from scratch, which isn’t necessarily a bad thing. Once the plant has sprouted and formed a few leaves, it’s well on its way to feeding you more of that awesome and yummy fruit that brought you here in the first place. Passiflora edulis will survive in zones 9a and up, but if you live further north it is easily kept as a houseplant over the frosty months. It might take a couple of years before yours gets big enough to flower and fruit, but it’s so worth the wait. When your plant is old enough, you might need to play matchmaker. Since most passion fruits aren't self fertile, yours might need to be pollinated by a different variety to produce fruit. Luckily, you can find ornamental varieties at your nursery to make that love connection. Also, butterflies love passionflowers so much that they rely upon them as host plants and will happily lend a hand! The caterpillars of zebra longwings and gulf fritillaries will quickly devour the leaves, but they'll quickly grow back in just a few days. That same vigor makes them a bit of a bully in the garden though, so be prepared to cut back any wandering tendrils or root sprouting suckers when they appear. I've returned to my garden after only two weeks to find it completely swallowed up by the greedy vines of my passion flowers! The best place to grow them is on a horizontal trellis, or more conveniently, a fence. Train one stem up to the top of the support, hold it in place, and prune the tip just above the base of a leaf. 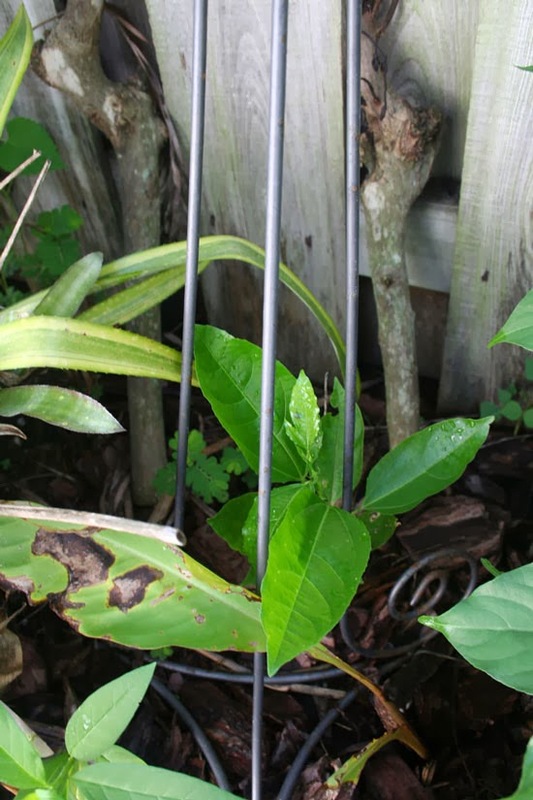 As new growth emerges, train the new stems horizontally along the top of the support, since passionflowers produce the most flowers on fruit on stems that drape down. Continue removing suckers from the ground to devote more strength to the main stems, or dig them up for transplanting elsewhere. Once the flowers have been pollinated, fruit will begin to form at the base of the shriveled flowers before swelling up to the size on an egg, turning yellow, orange or purple (depending on the variety and species) and begin to shrivel slightly. This means it's ready to eat! Now aren’t you glad you saved those seeds? Here the yellow passionfruit grows like crazy, but I have been trying to start a purple passionfruit. I was told to leave the seeds to ferment a little before washing off the membrane. that is the way I save tomato seeds as well. I have just planted them out so holding thumbs. I've just sowed some seeds. I love the seedy pulp with vanilla ice-cream and banana. How long from seed to fruit? Videos or pictures showing the vines and suckers would be helpful! Also harvesting ripe fruit. For turmeric and ginger as well. Got my ginger growing really strong! Thank you for all the informations about ginger and passion fruit . I am going to try it out .